It will not surprise anybody to learn that I am obsessed with the Cross House. This means that while I am obsessed with the house overall, I am continually overtaken with smaller obsessions. Thus, one week I might be fixated with, ah, stained-glass windows. Another week might be porch columns. This week I am obsessed with hardware. And it is all Bo Sullivan‘s fault. Anybody owning an old house will know exactly of what I speak. Amazingly, and particularly considering all that the Cross House has been through, almost all the 1894 hardware is in situ. There are three pairs of pockets doors, and these retain their hardware. But there is also a single very wide pocket door (between the main bedroom and sewing room). This door is missing its Yale & Towne door pulls. I knew this, but never gave the issue much thought. But as this week is the official Obsessed With Hardware Week, I had no choice — no choice! — but to scour the almost 9,000 square-foot house for the missing hardware. In the vast basement is shelving supporting a lot of house bits. There is trim and porch pieces and window parts and…hardware. In this treasure trove I found a pocket door pull. Whoee! But just one. My heart sank, for this meant that the matching pull was gone. Quite vexed, I thought: The matching pull must be here somewhere! The pulls though, like all the hardware in the house, looked dull and lifeless. So I cleaned up one pull. I think it is great how you keep finding missing bits and pieces to your house. What do you do to clean up the hardware, especially when it has paint on it? I have been cooking mine in an old crockpot to get layers of paint off. Why oh why did people in the past paint door hinges? I do the crock pot thing, too. It’s easy and does the job … and I curse at each and every prior owner of this house who painted the hardware. What cleaner do you put in the water in the crock pot? Among members of the Antique Doorknob Collectors of America, we use Arm & Hammer Super Washing Soda. It is a more benign version of TSP, won’t change the color of the metal, has a low fume quotient, and can be poured down the drain when done (once filtered of the paint goop and detritus). Your restorations look fantastic – just like the house itself, beauty and dignity restored. Sometimes I’ll use a little paste wax for finish protection, though I’m sure there are other tricks out there for that purpose. 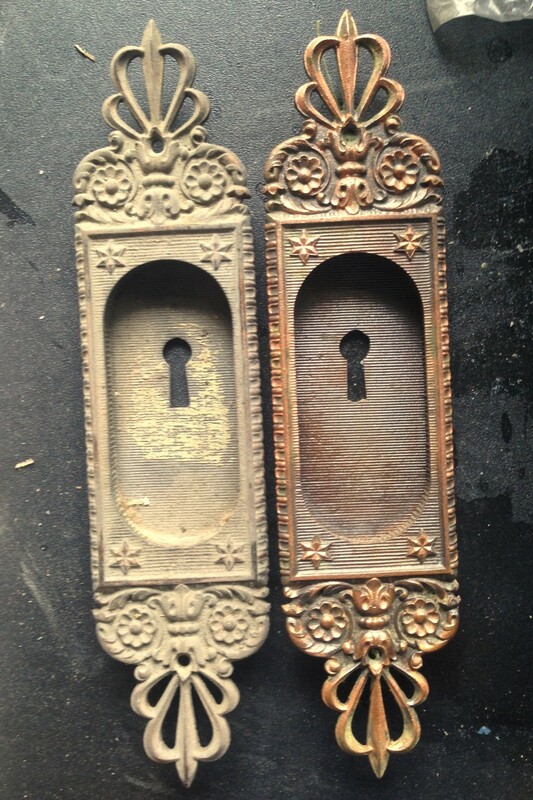 Bo, I’m going to hijack Ross’ blog for a moment to ask if you know anything about stripping composition doorknobs? They’re shellac and woodpulp (and blood!) thus nixing both strippers and the crockpot I think? Any ideas???? Hi Meg. There are numerous composition-type knobs out there, but it sounds like yours are Hemacite, possibly by William H. Dibble. I don’t know the answer to your question, but I’ll check with my knob buddies to see if anyone else does. All of the ADCA newsletters are available and searchable at no charge on the club website. Membership is only $25/year, if the bug bites you, and we have a convention every year (this year in Boston in July). The technique that you will develop will be what works best for you. Just remember that the less that you are trying to remove at a time, the less pressure you will need to apply. I use both hands to hold the scraper so I can use small controlled moves. The right hand might be pushing hard while the left is restraining the scraper so that you don’t lose control. It is a little hard to explain. Meg, or anyone else who finds this of interest. Please feel free to e-mail me if you have questions. Sorry this is so long, I kept remembering other things to suggest to you. Hope it works for you. Thanks for the detailed response. I have a substantial background in restoration, and sadly a scraper will only further damage these unusual doorknobs – they’re relatively soft and quite porous. At some point I’ll find the magic bullet! Dear Meg, I thought about writing this to you directly, bypassing Ross, so others wouldn’t be bored with my request, but I realized that others may share my interest, so, Will you post photos of your possible Hemacite knobs, so I can actually see what you are referring to. I love puzzles including figuring out how to do things such as this. For example, if it was worth the time, I might put your knobs in a lathe and wet sand off the layers of paint with high grit wet or dry sandpaper using mineral spirits as a lubricant which does not dissolve shellac. With that method, you could stop the moment you saw the color of their eyes…. Sorry, lost my mind for a minute….. color of the knob. 320, 400 or higher grit paper would hardly be removing much at a time, but with a lathe at high speed, you could start with the highest grit and go down until you are comfortable with the removal rate.